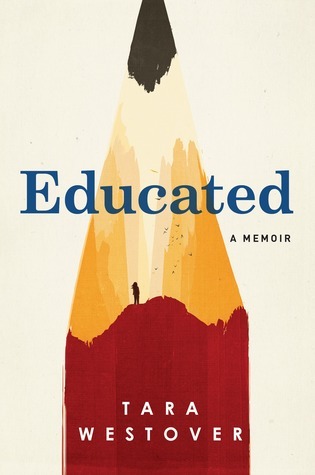 There has been a ton of buzz about Tara Westover’s memoir Educated. I have heard several people liken it to Hillbilly Elegy and The Glass Castle. I was intrigued by the concept and checked it out from the library. Tara Westover grew up outside of a small town in Idaho with her survivalist Mormon family. She never went to school until she went to college at Brigham Young University. She went on to graduate from BYU and then went to Cambridge for graduate school. However, most of the memoir takes place as she grows up in Buck’s Peak, Idaho. Her childhood and family life was insane, and it is truly a miracle she was able to move away and start her own life. Tara is the youngest of seven children. Her three oldest brothers experienced a different early childhood than the younger Westover children did. Tony, Shawn, and Tyler were allowed to attend school for a few years before Tara’s dad, Gene, began to get paranoid that the federal government would come and interfere, like the FBI did to the Weaver family. After that horrendous disaster, Gene Westover refused to ever trust the government, doctors, or schools again. By the time Tara was old enough to attend school, all of her other siblings were helping around the house and junkyard. Tara’s brothers Tyler and Richard were more interested in reading and learning than any of the other siblings, and when Tara would spend time with Tyler, she would take whatever textbook was in the house and read it. However, there was no formal schooling; Faye, Tara’s mom, would sometimes gather the kids around and attempt to teach for an hour or so, but most of the time, each child was on his own to learn. Eventually Tyler left home to go to college. Once he left, Shawn returned home, and thus began the horrors of Tara’s childhood. As Tara grew older, she started singing at church and then miraculously convinced her parents to let her audition in the town musicals and plays. But when Shawn moved home and would pick Tara up from play practice, he noticed how she would talk to a boy named Charlie. Shawn began calling her a whore and frequently beat her. He would do this when they were home, but no one ever did anything to stop Shawn. This happened for years, and it wasn't just Tara being abused. Shawn needed control and didn't take any backtalk from any female, especially his girlfriend and then later his wife. Eventually, Tara made up her mind to get away from the house and studied for the ACT, so she could apply to BYU. Once her score was high enough, she applied by lying about being homeschooled. She was accepted and began school at seventeen years old. When Tara moved into an apartment with two other girls, she was completely thrown for a loop by the college culture. She was unaccustomed to seeing girls wearing tank tops or skirts shorter than the knees. She didn’t understand how to study and really struggled with making friends. But the real turning point was when she was sitting in a history class and did not know what the Holocaust was. She thought she had heard something about it from her father at some point, but quickly realized after a trip to the library that her father's version of historical events was not the right one. Thus began her interest in history; she would go on to study historiography (the study of historians) at Cambridge. Another "aha moment" for Tara was when she heard a professor use the term bipolar disorder. After researching the disorder, she realized that her dad was bipolar. Being at BYU, then Cambridge, enlightened Tara to the ways of the world and made her realize how abnormal her upbringing was. She still loved her family, but she could no longer justify their beliefs and behaviors. I was horrified at how awful her home life was with her brother Shawn. Even after she came home from school, Shawn still managed to assault her. When she tried to confront her parents about his behavior, they basically turned against her and cut her off. By losing certain members of her family, Tara spiraled into an emotional breakdown. She remained close with Tyler and Richard and their wives, but lost contact with the rest of the family. Eventually she made peace with her situation, but still misses her family. Educated is an incredible true story; there were parts that I could not believe actually happened to the Westover family. There were so many horrible accidents that happened that it was difficult to believe it could happen to one family. While I enjoyed Westover’s story, I wished she could have spent more on her time once she was at school. To me, it would have been more fascinating to really see the contrasts between her “homeschooling” and her actual education. I think it would have helped strengthen the story, instead of focusing so much on Shawn’s abuse and her family’s extremist views. Although Educated was an extremely fascinating memoir, I did not connect to it like others have. I give Educated 3.5 stars.